Learn More About Shelter House Play Therapy! What if I shared a secret with you about what I have learned after years of being a play therapist, sand tray therapist, art counselor / art teacher, creative counselor, and a school counselor? This secret is one of the most powerful tools I have ever utilized as a mental health professional. Its origins are in play therapy, inner child therapy, art therapy, sand tray therapy, color psychology, and many other therapies. It is a conglomeration of every therapy theory and technique I have ever learned or used with my clients. I happened upon the basics of this tool when I was working as an adjunct college professor with graduate counseling students at Mercer University in Atlanta. I have used the doll house play therapy technique for years before I ever became a college professor at Mercer. I found it a useful tool for reenactment of the life events my students went through. If I had a DFACS referral on a student, I would often ask the student to show me what happened at home by using the doll house. This tool helped me see all the pain and trauma that was going on within the student due to the root cause of the referral. Fast forward many years later, I was teaching play therapy and sand tray therapy at Mercer University in Atlanta to graduate counseling students. I knew that a lot of the students had never been in therapy as a client themselves. I felt that before they were allowed to counsel others they needed to acknowledge their own inner issues. The “Doll House” was the perfect platform to bring forth these issues and show the student what they needed to work on for their own personal growth. My final exam for the play therapy class was for the graduate counseling student to build a “doll house” based on the house they grew up in. 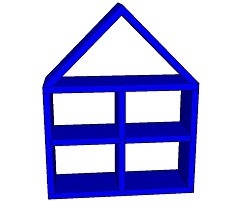 If the student lived in several places, they could combine the many houses into one. If they lived in an apartment, townhouse, or trailer, they would build an apartment, townhouse, or trailer. The student would also choose miniatures to represent their family members. Once, a student used a tarantula spider as the father. Another used a shark to represent his mother. The students often used the same miniatures they choose to use for the play therapy genogram. Each student was also expected to decorate the house the way the house they grew up in was decorated. These students had sixteen weeks to decorate and build their house. They were not allowed to get a kit. They had to make the furniture themselves. It was quite an extensive project that brought about many complaints. However, what happened during the building process was absolutely essential to the outcome I wanted from the student during their final exam presentation.